Komodo National Park, located in the center of the Indonesian archipelago, is located at the meeting of two continental plates, this national park constitutes the “shatter belt”, between the Australian and Sunda ecosystems. The park is identified as a global conservation priority area, comprising unparalleled terrestrial and marine ecosystems. 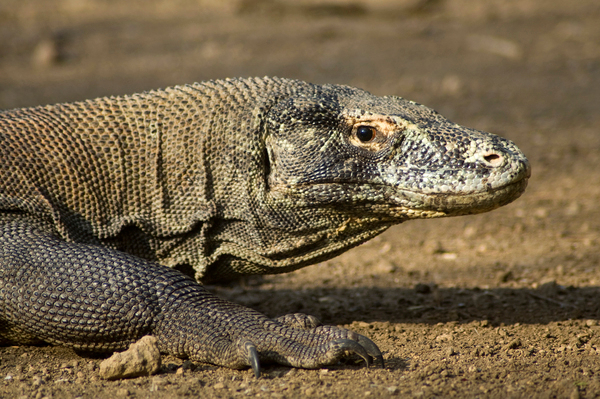 The park is best known for the Komodo “dragon” monitor, the world’s largest living lizard, measuring up to 8’ long! Upwelling of nutrient-rich water from deeper areas of the archipelago is responsible for the rich reef ecosystem. 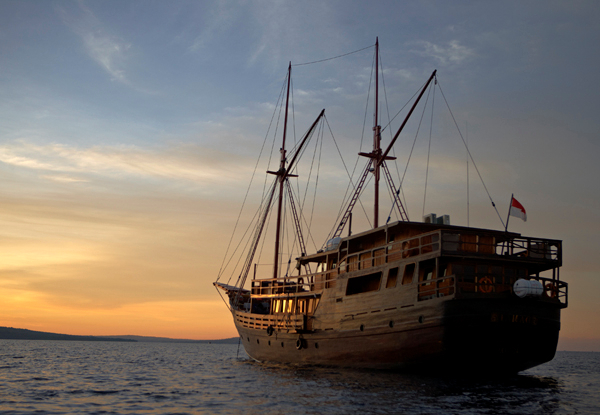 The variety of marine life that you can see in Komodo rivals any of the world’s best dive destinations. 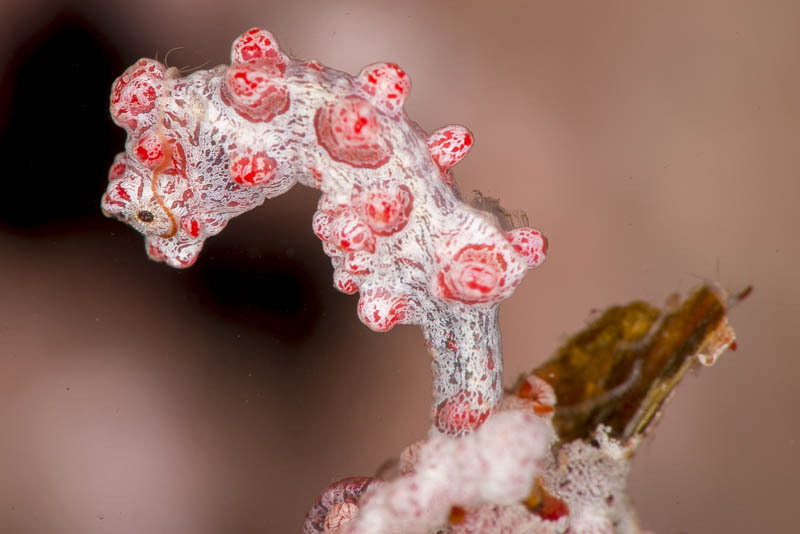 From sunfish, mantas, dolphins, sharks and eagle rays to pygmy seahorses, ornate ghost pipefish, clown frogfish, nudibranchs and blue-ringed octopus, all are at home amongst a spectacular range of colorful sponges, sea squirts, tunicates and corals; Komodo is an underwater photographer’s heaven! In Jan/February, there are good conditions in the south. Horseshoe Bay, a favorite spot, is bluer, clearer, and warmer. 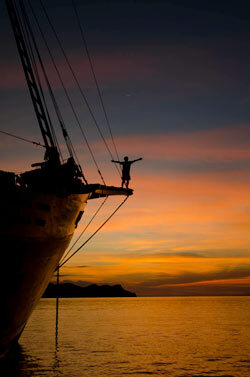 This charter is a repositioning cruise, as the boat leaves the Komodo area and goes to Flores Island. With luck, we'll also be able to see the fantastic Komba volcano from the water. Although 11 days in length, we are only being charged for 10! This beautifully designed wooden boat been designed to offer a personal luxury service that only a vessel of this size that is dedicated to small groups can provide. With an overall length of 40 meters (130 feet) and a beam of over 8 meters (26 feet) the vessel has large single or twin share cabins are furnished with queen beds, and ensuite heads. The vessel has been designed with three large deck areas for relaxing in both the sun or shade and for enjoying relaxing massage and spa treatments. Specifically designed for divers, the vessel offers large dive stations with individual rinse tanks and a camera room with separate camera work stations with integrated charging stations for each photographer. The vessel offers a divemaster/guide to customer ratio of 4 to 1, ensuring the best service underwater as well as onboard. Your trip leader Jack Connick from Optical Ocean Sales will be available to help you with presentations on subjects ranging from strobe positioning to Photoshop Lightroom. 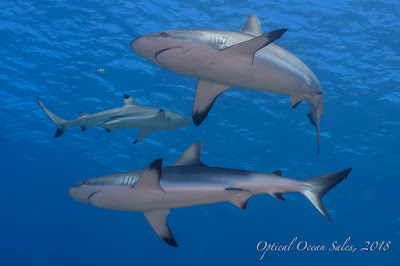 Join us on this fantastic liveaboard trip starting at $5600! $1000 deposit. Additional payments due every 8 months, final payment due Sept. 2016. Airfare not included. or call 800-359-1295 or +1 206-284-1142 today!